The Kytola variable area flow meter Model VD is a heavy-duty instrument designed for reliable use in industrial environments. Typical applications include lubrication oil measurement, flush water applications, gas flow measurement, and sealing and cooling water measurement. 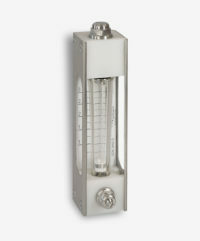 Model VD flow meters have a built-in flow adjustment valve and come with a quick-change flow tube for easy use. Products are available in a wide range of material options, with slight design variations available in the Model VE and Model VL meters. Optional features include low/high flow alarms, constant flow regulator and higher-grade materials suited to specific applications.